A dry, literal, strictly by-the-book new biography of the Hoosier novelist favored by American mythmakers but excoriated by stylists. Less than 15 years after the completion of Richard Lingeman’s two-volume Theodore Dreiser (1986, 1990), it’s hard to justify another examination of this unlovable naturalist whose public contentiousness obscured his literary achievement. But Loving (English/Texas A&M; Walt Whitman, 1999, etc.) 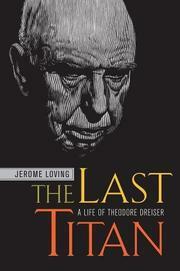 was determined to write a biography “in which this controversial life was put back into the context of his great literary contributions.” Indeed, Loving has examined every inch of Dreiser’s considerable output and sets each character and plot twist into the framework of the author’s long life (1871–1945). It’s a tedious scholarly task to pursue the story of this last of 12 siblings born to struggling German Catholic immigrants in Terre Haute, Indiana, who left home to seek his fortune in his late teens and transformed himself from a newspaper hack into a determined, disciplined, and finally, with An American Tragedy in 1925, rich novelist. The lukewarm publication in 1900 of Sister Carrie unceremoniously announced a new kind of American literature, closer to the realism of Balzac and Zola: unsentimental, scathing in its examination of real life (high and low), and resistant to facile moral answers. Dogged throughout his career by criticism that his writing was crude, his view of Social Darwinism ugly and immoral, Dreiser was often caught in the contradiction, notes Loving, between “his activist sympathy for the exploited poor in corporate America and his belief in the survival of the fittest.” Overall, the biographer paints a somber portrait of a charmless man who stood by his German roots and hated the British, who could be callous even to friends like long-time supporter H.L. Mencken, and who used women to fulfill an insatiable need for sympathy while exploiting their hard lives to novelistic advantage. Like much of Dreiser’s fiction, unlikely to be taken up for sheer reading pleasure.